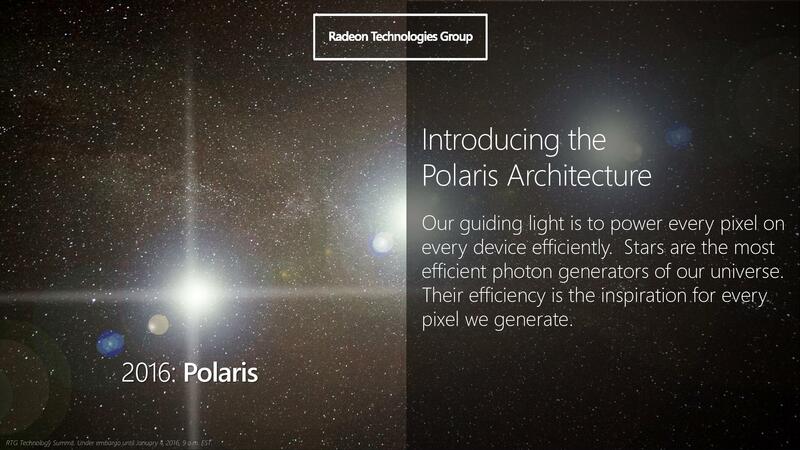 Today AMD is officially announcing its next generation graphics architecture “Polaris”, which will be powering upcoming Radeon graphics products in 2016. As we’ve come accustomed to, with each announcement we get a glimpse into the company’s latest and greatest tech and this time it’s all about graphics. 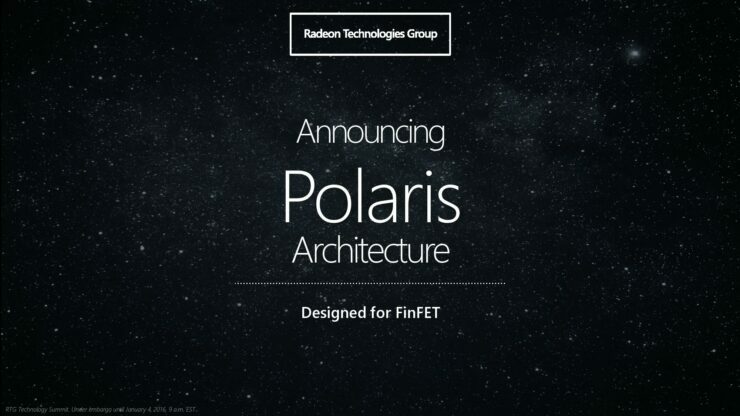 The hallmark of AMD’s next generation Polaris architecture is the highly anticipated move to the revolutionary FinFET process technology and considerable engineering focus on innovations to push architectural efficiency. Let’s first explain what “Polaris” exactly is. Graphics products are no longer just pure graphics engines, they’re complex SOCs with several other key engines each designed meticulously to be the most efficient at a specific task. These include display engines for media decode and encode, controllers for standard interfaces such as DisplayPort and HDMI in addition to caches, graphics engines and internal management blocks among other IP. 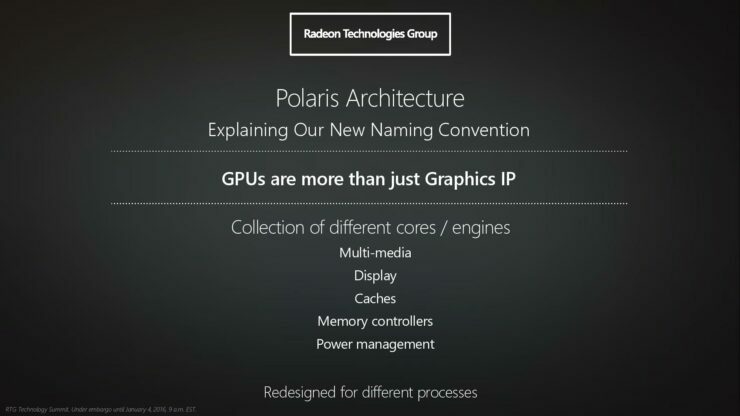 Polaris as such doesn’t just describe AMD’s 4th generation GCN architecture, but a broad collection of new visual computing IP. 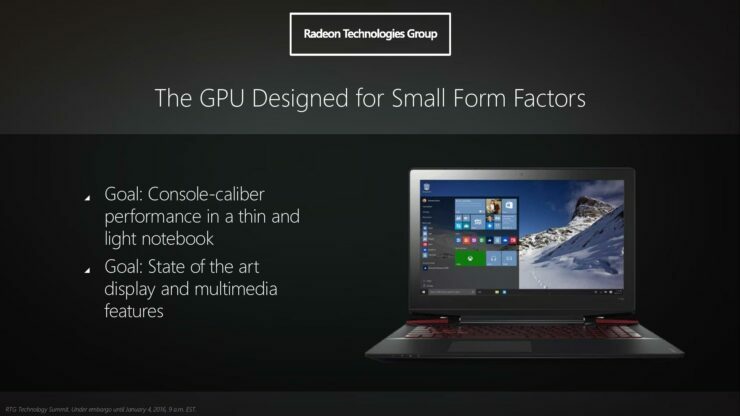 For AMD’s 2016 graphics products the company updated all aspects of its graphics IP. Including the addition of support for DisplayPort 1.3 and HDMI 2.0a in addition to h.265 decode at up to 4K and encode at 4K and 60 FPS. 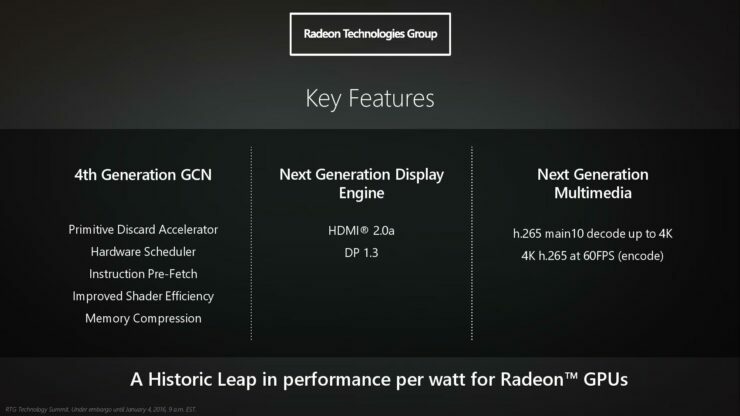 In addition to the foundation of AMD’s current generation GCN architecture, 4th generation GCN introduces new features. One notable new feature is primitive discard acceleration, which in no certain terms is AMD’s way of revealing that its upcoming GPUs will add support for additional key DirectX12 features such as Conservative Rasterization. Furthermore, this list does a great job of showcasing just how advanced modern GPUs have become. Instruction pre-fetch is a technology that’s long been employed in CPUs and it works to improve performance by reducing stalls and unnecessary wait times. So it’s quire remarkable that this technology is now part of modern graphics engines. Which really goes to show just how complex these beasts have become. It’s important to note though that instruction pre-fetching in GPUs isn’t an entirely new addition, current graphics architectures do support various implementations of it. 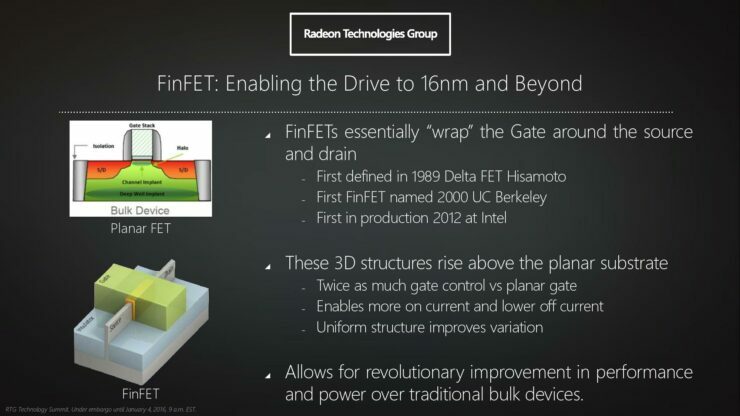 However, these implementations have been traditionally quite limited in nature and it’s AMD’s plan to push for a more robust implementation to realize all the compute benefits that instruction pre-fetching entails. 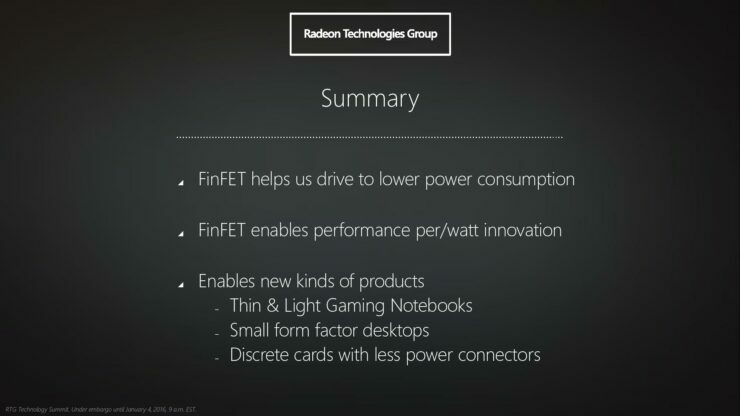 During the announcement session, AMD went into relatively broad technical detail about why FinFET technology is such a great thing for GPUs and why the Radeon Technologies Group is really excited about it. 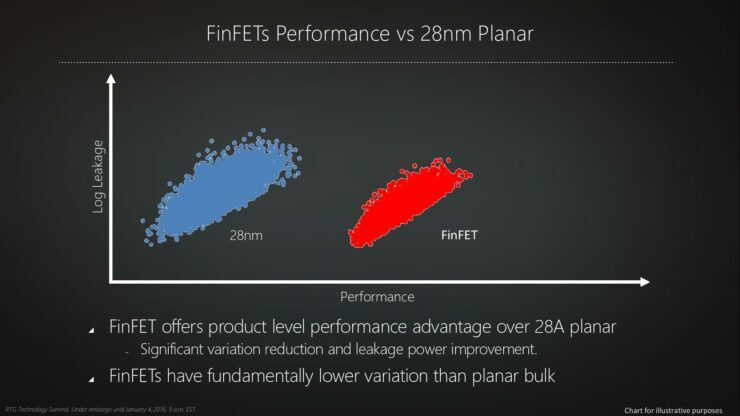 It all really comes down to two significant advantages that FinFET offers over 28nm planar around current and leakage. FinFET devices can deliver higher on current and less off current and exhibit significantly less leakage than planar transistors. 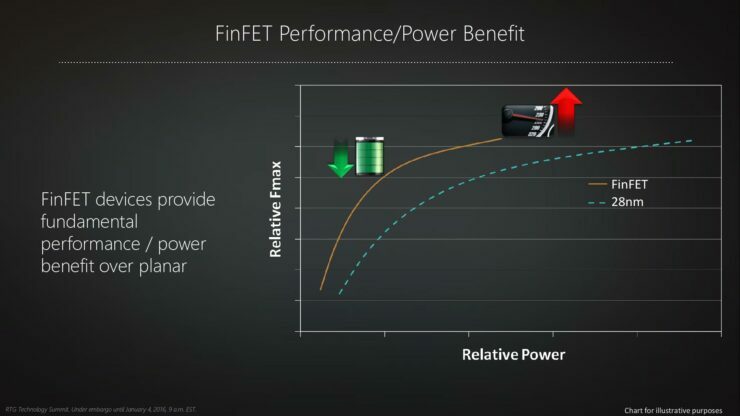 These two critical advantages mean that designs based on FinFET will consume significantly less power at idle and at load. Additionally thanks to FinFET’s superior switching speeds SOCs optimized for this process can achieve significantly higher clock speeds. In a nutshell, it means that gamers will be able to enjoy significantly more powerful and more power efficient Radeon GPUs later this year. 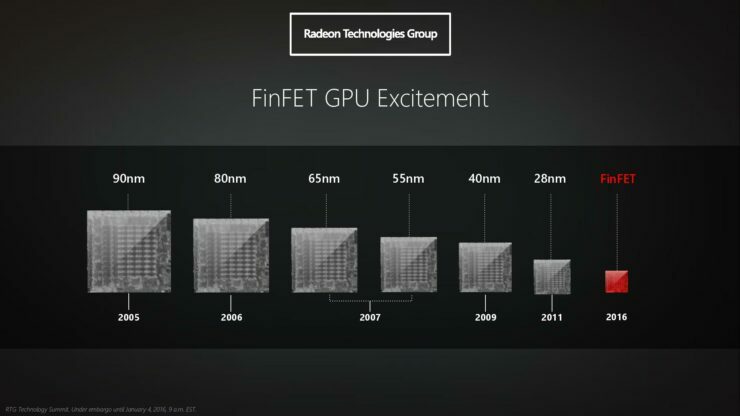 What’s New In AMD’s 4th Generation Graphics Core Next? Well the answer is a lot and to help me explain what exactly AMD has improved, updated or replaced I’m going to borrow a very handy diagram that AMD had shown us. The majority of the IP blocks in the graphics engine are new. Including a memory controller, for upcoming memory technologies, in addition to more capable and more power efficient compute units and geometry engine. The level 2 cache and the command processor have also been updated. Beyond what AMD detailed above about the key features and the display/multimedia updates the company did not go into much detail about what exactly went into these new IP blocks. We were promised more information will be revealed as we get closer to the release of Polaris graphics products. 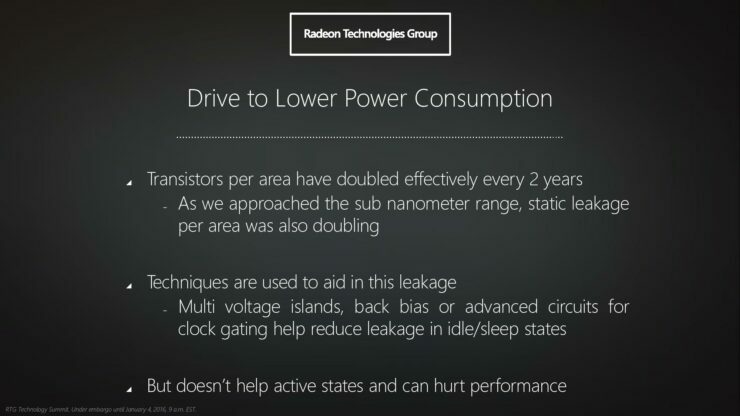 To put all of the architectural and FinFET related power efficiency improvements into perspective AMD did a little demonstrated with an actual Polaris graphics chip. The demo included two identical systems, one with a Polaris video card installed and the other had a Maxwell Nvidia GTX 950 graphics card. Although the company did not disclose any details about how many compute units or transistors this Polaris GPU had, AMD did show us the actual chip that was running the demo and it looked absolutely tiny. With the two identical systems running Star Wars Battlefront, a reading of the active power usage of each system was recorded via a power meter. The Polaris equipped system recorded an average of 86W, while the Maxwell based GTX 950 machine recorded an average of 150W in the actual demonstration that saw, and 140W in AMD’s labs. This amounts to a delta of 53W if we go by the lower recorded average power of 140W and a 63W delta if we go by the reading the we saw during the demo. This brings us to the end of the announcement. 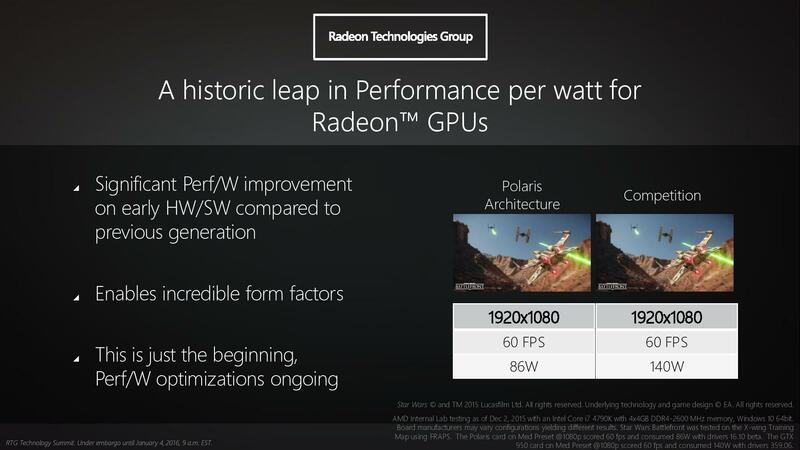 Thankfully however, AMD had one last thing to unveil and that is Polaris based Radeon graphics cards are expected to come to market in mid 2016. But of course if you’re an avid Wccftech.com reader you already know this. As that’s exactly what we had already revealed to you in our exclusive report last month. 2016 really is going to be a pivotal year for PC gaming, AMD and its rivals. With FinFET based graphics cards coming out along with major CPU launches and DirectX12 games set to be released in 2016, this year is shaping up to be one of the most exciting ever for PC gamers and hardware enthusiasts. 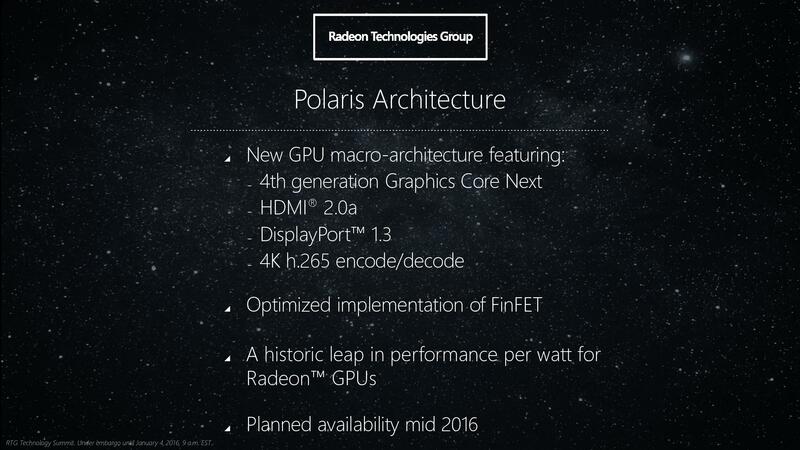 [UPDATE : 2016 January 5, 10:43 AM ET] The first graphics card belonging to the brand new 14nm Polaris family is reportedly planned to launch within as little as 2 months. This new graphics card is going to be the smallest in the family with major focus on mobile platforms and power efficiency. More powerful graphics cards of the Polaris family are set to debut around mid 2016. It is likely that this is the first Polaris GPU being brought up (after only 2 months I’m told) and could represent the best improvement in efficiency that we will see. [UPDATE 2 : 2016 January 5, 11:59 AM ET] PCPer’s Ryan Shrout issued a clarification stating that the Polaris GPU AMD demoed was up and running after just two months from when initial production kicked off, rather than being brought up to market after two months. We’ve reached out to AMD and they have confirmed that the Polaris GPU demoed was in fact built using Globalfoundries’ 14nm FinFET process. Some publications have reported that Polaris will be a mix of both TSMC 16nm and Globalfoundries 14nm GPUs, which is where some of the confusion could potentially have stemmed from. 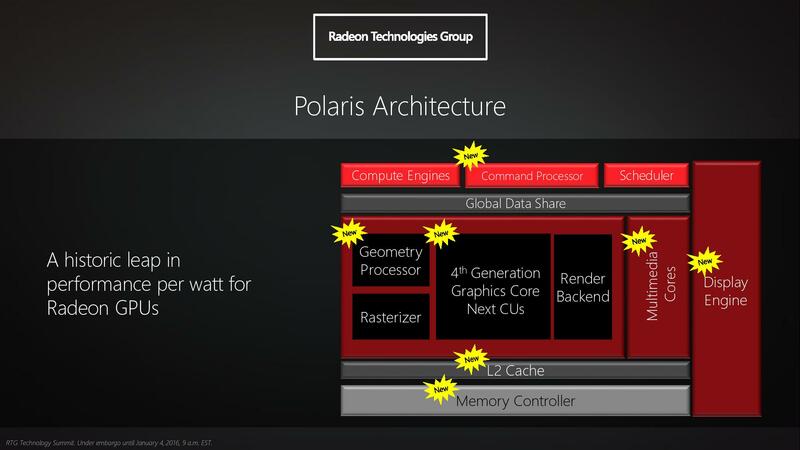 However, according to AMD Polaris “is only 14nm”.